What do you love? and why? I think this one jumped out at me because I had an immediate answer. And then later, several other answers came to mind. And then of course, several more. So much to love, so little time. But the simple answer, the one that immediately popped into my head was this: life. Although, of course, life is never simple, is it? And some days, life is hard. Or sad. Or unfair. Or a struggle. But that’s the thing about life. It gives you lots of second chances. Each day is a new beginning, Or each hour, or each minute, or each breath, depending on how you choose to look at it. Because if you’re here, and you’re breathing, you’re in it. A gift that is so easy to take for granted, while at the same time, being the most precious gift of all. Now, of course, my life is not perfect. In many ways, it hasn’t turned out the way I expected, or hoped, that it would. But in many, many other ways, I am blessed. I have a home. No, it’s not my dream home, but it is the home in which I dream. I make my living as an artist from this home. There is never as much money as I’d like, but every day, I do something I love. I have food on my table, some of it grown in my garden. Almost always, I also have a vase full of flowers on that same table. I have family to eat with and gather round, I have tea to drink in the morning, a slice of cinnamon toast before I go to bed each night. Small things, simple pleasures, second chances. And there is beauty all around me, in a child’s smile, a bud on a tree, the painted sky of a setting sun. There are words that come as gifts, and words that fight their way to the surface. There is the tiny bunny rescued from the dog that killed his siblings. 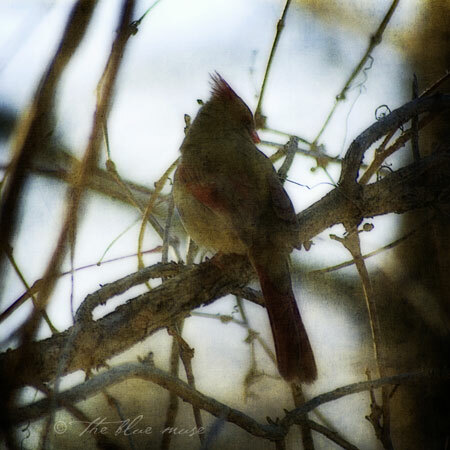 There is a cardinal singing love songs in a tree. There is joy and sadness, tragedy and comfort, flight and falls. Through it all, there is hope. Hope for a better world, hope for more kindness, hope that I will remember, every day, to stop and live the life I’m in. This wonderful, difficult, charming, exhausting, filled-with-second-chances progression of days. Because having the courage to fly isn’t just about spreading your wings. So beautiful, I especially love the part about where you talk about your home . . . ” I have a home. No, it’s not my dream home, but it is the home in which I dream.” We have a lot to be grateful for. Great post! I agree I love life – I’ve even gotten to the point that I’ve realized the times I love life the most are when I’m being challenged and things aren’t easy. It is when I feel most powerful and full of joy. Great post! i totally agree, life is amazing.. That doesn’t mean that it is always what we want it to be, but the hope and the other chances in each breath are wonderful! Beautifully written! Loving life-no matter what-breath-in-out-in-out–what words! I loved this…thanks-you challenged me today. Oh how beautiful! Thank you for reminding me of how precious and wonderful life is! The older I get, the more I realize how precious and valuable life is. Not because that’s the way it is for everyone, but because I choose to see it that way. Thanks for the lovely reminder! you’re right. Life is made up of the, “Small things, simple pleasures, second chances.” and we can have the courage to honor that, bring our light to life and express joy. Spreading our wings means being in the flow of LIFE, not only soaring but breathing in and out – wow. beautiful. thank you. Thanks for reminding us of how fortunate we really are! Indeed, it is a beautiful life. Your capture and editing are simply gorgeous!!!! i totally loved this! it really brought me back to what i loved about my own life. thank you for that! Great share. I particularly like the idea of a home in which to dream vice a dream home. Very me. yes, I agree … life is the most beautiful gift … we each get to unwrap daily … a most awesome post! hello kelly, i am just getting caught up on some of the blog posts for the courage to fly blog hop when i ran across you. what a lovely voice you have. thank you for sharing your words. i am learning this more and more every day. there is beauty in every breath and so much to be grateful for, even in the difficult things in life. i have learned this all too well. sometimes the most precious gifts can grow from the broken places.